New Super Mario Bros. U​ is a whole lot better than I remember it to be. I played it on its first launch day in 2012 on my then shiny new Wii U. Riddled with scatches and dust from neglect, I don’t have many good memories of my days playing the Wii U, and perhaps that’s part of the reason why I don’t remember ​New Super Mario Bros. U​ too fondly. As for ​New Super Luigi U​, the B-side to this brilliant platformer? It’s equally impressive on the Nintendo Switch, but for different reasons. The release of ​New Super Mario Bros. U Deluxe​ on Switch follows Nintendo’s delightful trend of bringing underplayed Wii U gems to a console that people adore. ​Mario Kart 8 Deluxe reminded us in 2017 that it is the best Mario Kart game of all time. ​Captain Toad: Treasure Tracker​ gave Toad’s wonderful puzzle platformer new life. And now, ​New Super Mario Bros. U Deluxe​ is here to make us (or at least me) rethink its place in Super Mario history. After tearing through both ​New Super Mario Bros. U​ and ​New Super Luigi U​ on Switch, it’s clear to me that the only Mario sidescroller that (maybe) has it beat is ​Super Mario World​. ​New Super Mario Bros. U​ Deluxe is a spectacularly designed platformer that never once rests on its laurels. As always, a jubilant gathering of friends in the Mushroom Kingdom is spoiled by the invasion of Bowser, Bowser Jr. and a bunch of their ​Koopa buddies​. They kidnap Peach, lock her in the top floor of her castle like Rapunzel, and slap Mario and friends far away with a giant mechanical arm. Is the extremely repetitive plot tired at this point? Yes, probably, but it only takes a few minutes hop, skipping, and jumping through the grassy Acorn Plains to remember that the plot of a Mario game doesn’t really matter. New Super Mario Bros. U​ plays just like the classic SNES games. It has checkpoint flags and tall finish line flags followed by small castles. 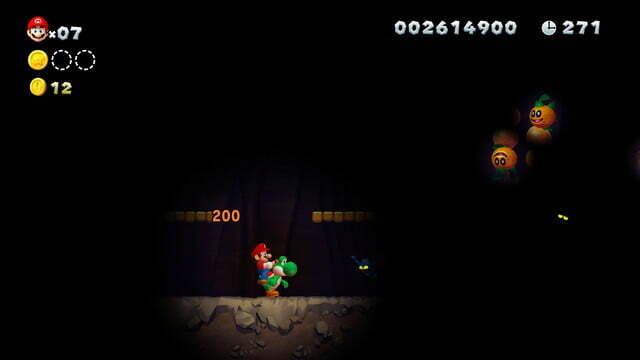 Many of the enemies are familiar such as Goombas and Koopa Troopas, and the boss fights take on the classic “three-hit and they’re dead” approach, fit with spinning shells you’ll have to avoid in between each successful whack. It’s so well-known at this point that you wonder when Nintendo will pull out the rug and change it to four or five just to see the reaction of fans. Playing it now, six years removed from its lackluster launch, allowed me to view this excellent platformer in a new light. It’s actually understandable, looking back, why ​New Super Mario Bros. U​ felt like a minor disappointment in 2012. The unfortunately-named “New” sub-series had been around since 2006 on Nintendo DS. Three like-minded entries had already arrived by the time it hit stores, including New Super Mario Bros. 2 for Nintendo 3DS just months later. Sure, ​New Super Mario Bros. U​ looked better than its predecessors, with glossy HD visuals, and lots of color and textures that gave off a 3D appearance. But it didn’t look ​that much​ better. The Wii U’s system seller lacked the flair and innovativeness that typically comes with Nintendo launch games (i.e. ​Super Mario 64​, ​The Legend of Zelda: Twilight Princess,​ ​The Legend of Zelda: Breath of the Wild​). Playing it now, six years removed from its lackluster launch, allowed me to view this excellent platformer in a new light. For starters, it’s easily the most dynamic sidescroller in Mario canon, with shifting platforms of different shapes and sizes galore, a bounty of secret areas to discover, and enemies that actually pose a serious threat if you aren’t careful. 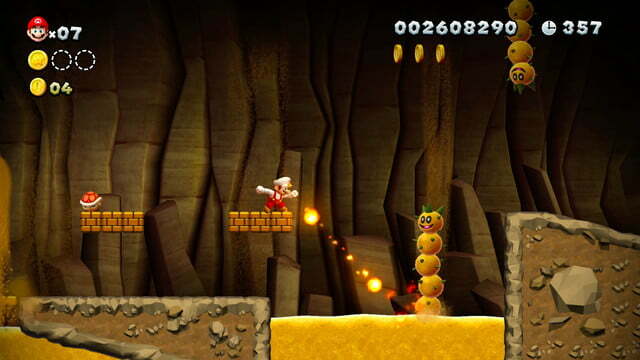 From the ice-cream infused Layer Cake Desert world to the underwater paradise of Sparkling Waters to the lava-soaked lands around Peach’s Castle, ​New Super Mario Bros. U​ makes great use of each of its themes, twisting and turning the gameplay, obstacles, and enemies with each passing level. The large stages are impeccably designed in a manner that ensures you’ll be revisiting them to see how they tick. 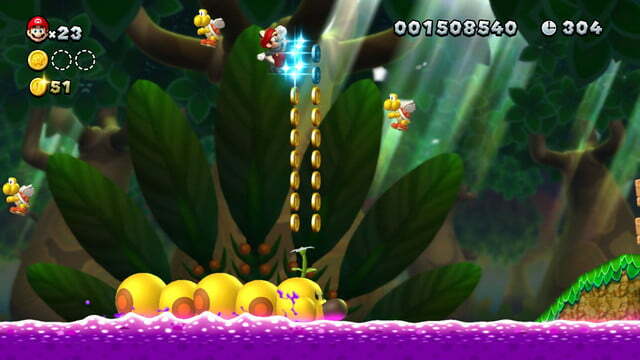 And, of course, to secure any of the three hard-to-reach gold coins you missed the first time around. 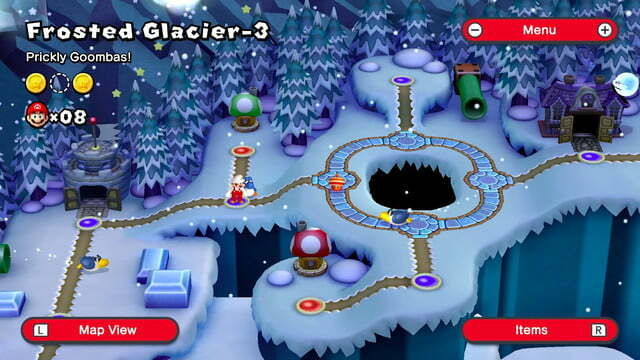 Many of the levels and worlds were inspired by previous Mario games, but they never feel anything but unique. In a sense, ​New Super Mario Bros. U​ is a remastered greatest hits collection, with Nintendo adding new trappings and flourishes with all of the knowledge accumulated from decades of making 2D Mario games. The large stages are impeccably designed in a manner that ensures you’ll be revisiting them to see how they tick. The inventiveness of the levels extends to the overworld map as well. It’s not quite non-linear, but you have choices of which levels to play first (you can even skip an entire world if you so choose). Enemies circle some of the spaces on the map. If you run into them, you have to win a close quarters fight to move on. The map brims with life, which sets an appropriate stage for the levels it houses. Every time I hit a question block and saw the magical acorn roll, I got irrationally excited. 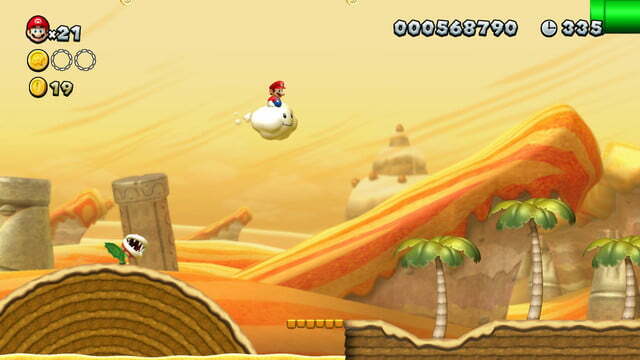 The acorn turns Mario into a flying squirrel, and yes, it’s as cute as it sounds. It’s largely the same experience as six years ago, but a few new additions do manage to add value. You can play as the nimble Toadette (who can power-up into super-floaty Peachette) and Nabbit, a character who cannot take damage from enemies (perfect for kids who are just learning how to play). The new characters make the four-player local co-op better when playing alongside youngsters (like my daughter), but four experienced Mario players may not like having to play as one of the easier options. New Super Mario Bros. U​ is the calm experience where you have the opportunity to take everything in. ​New Super Luigi U​ is the storm. It’s not just that you only get 100 seconds to complete each level, it’s that each level removes the breathing room between integral, make-or-break moments. Every moment of ​New Super Luigi U​ tests your reflexes and ability to make quick-witted moves on the fly, without slowing down to second guess yourself. The world map, boss fights, and even the opening cutscene are the same as in Mario’s adventure, but it’s far more than a mere add-on expansion. 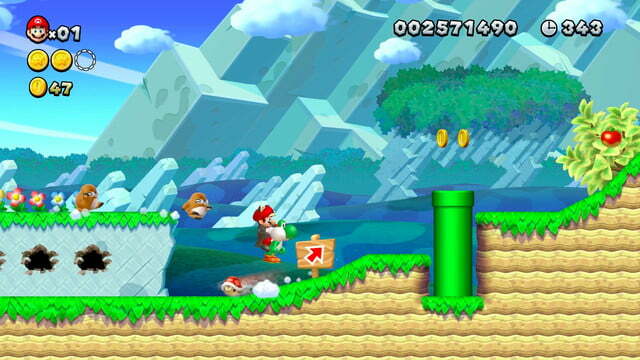 While each level holds the same thematic layout as the Mario version, the levels are entirely different. Checkpoint flags are gone, so if you die during a boss fight, it’s back to the beginning. Luigi’s version of the adventure even includes new mechanics like swinging vines and throwable barrels. 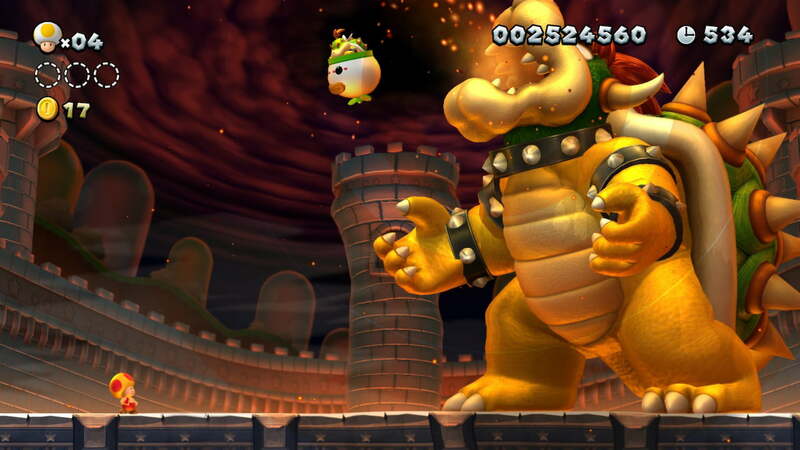 Just like ​New Super Mario Bros. U,​ each level adds a new wrinkle of difficulty, with new elements used sparingly to keep the experience novel throughout. 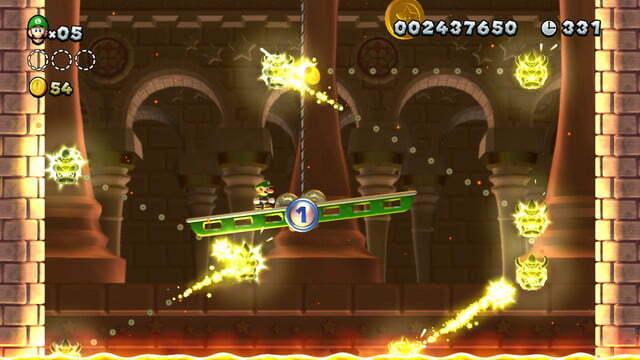 Every moment of New Super Luigi U tests your reflexes and ability to make quick-witted moves on the fly. 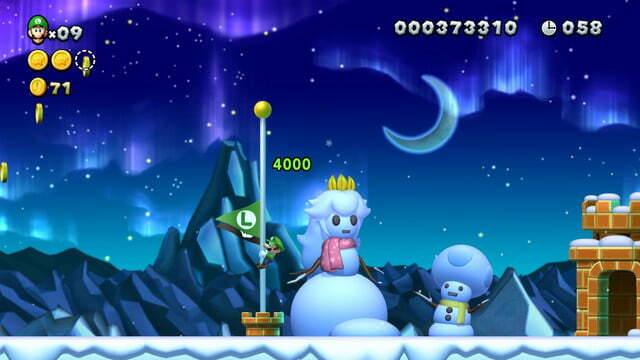 Luigi and the other three playable characters (Mario isn’t available) jump markedly higher than in ​New Super Mario Bros. U​. The fluttery jump doesn’t make things easier though. Instead, it makes landing where you want more of a challenge. The mechanic reminds me of the floaty controls seen in early 2D Mario games. 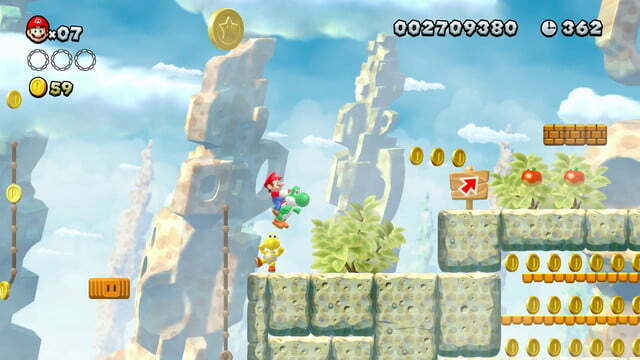 It’s not the stop-on-a-dime Mario series platformer controls we’ve become accustomed to over the years. It’s striking to play these games back-to-back rather than a year apart (​New Super Luigi U​ was originally released in 2013). While they have the same foundation, each one offers a unique experience. 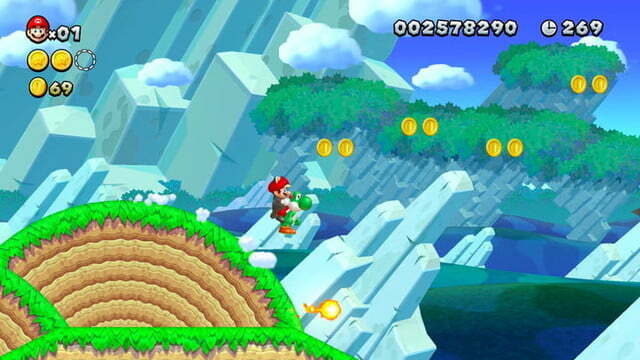 ​New Super Luigi U​ is easily the hardest Mario game since the SNES era, but it never feels unfair. Often times, you have to learn each level’s obstacles on the fly, memorize the jump pattern and progression, then put it altogether in your successful run. The chaos is part of its charm. New Super Mario Bros. U​ ​Deluxe​ gives an overlooked pair of Wii U gems new life on the Nintendo Switch. ​New Super Mario Bros. U​ is the most dynamic and inventive Mario sidescoller ever created, and ​New Super Luigi U​ offers one of the toughest tests in Mario history. ​New playable characters​ make ​Deluxe​ super approachable for players of all skill levels to enjoy one of the most joyous 2D platformers in recent memory. Yes, ​Super Mario Odyssey​ is the better Mario game on Switch, but ​New Super Mario Bros. U Deluxe​ offers some of the best 2D platforming on Switch. We completed ​New Super Mario Bros. U​ in about 10 hours and ​New Super Luigi U​ in about five. But collecting all of the coins and playing through the secret worlds could take you upwards of 50 hours.